DENVER, March 21, 2018 /PRNewswire/ -- DaVita Kidney Care, a division of DaVita Inc. (NYSE: DVA), a leading provider of kidney care services in the United States, recently launched its "Today's Kidney Diet: Simply Spring" cookbook, a collection of bright and tasty kidney-friendly recipes for spring. From Carrot and Jicama Salad to Ceviche Caribe, the cookbook highlights 14 kidney-friendly dishes featuring wholesome ingredients and seasonal fruits and vegetables. Each meal contains lower levels of sodium, potassium and phosphorus as well as high-quality protein to help dialysis patients get the nutrition they need. "The 'Simply Spring' cookbook recipes were carefully crafted by our talented group of dietitians to help people living with kidney disease plan and prepare meals that are both delicious and meet their kidney diet goals," said Sara Colman, RDN, CDE, and manager for DaVita.com nutrition. The cookbook also features tips for simplifying spring meals, knowing what's in season now and how to pick the best spring celebration treats and foods. 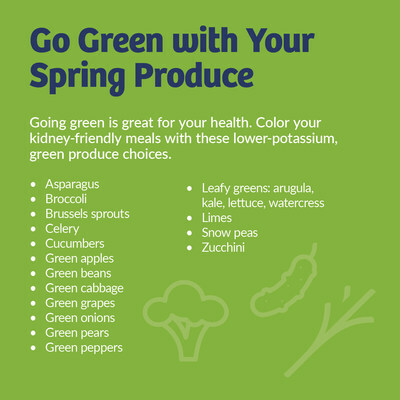 Additionally, "Simply Spring" includes Today's Kidney Diet: Quick Reference Guide, which has information to help people choose food options that are better for their stage of chronic kidney disease. To download the "Today's Kidney Diet: Simply Spring" cookbook and others at no cost, visit DaVita.com/FreeCookbook. DaVita Kidney Diet Tips blog at blogs.DaVita.com and Pinterest at Pinterest.com/DaVitaPins that offer recipes and kidney-friendly diet tips. DaVita Diet Helper™, an easy-to-use meal planning tool that tracks phosphorus, potassium and sodium intake. This tool also features more than 1,000 recipes that are kidney-and diabetes-friendly. According to the Centers for Disease Control and Prevention, more than 30 million Americans have kidney disease, which can progress to end stage renal disease. Most are unaware of their condition, as the disease is often symptomless until its late stages. Individuals at higher risk for kidney disease include those with diabetes or hypertension, as well as adults age 65 and older, African Americans, Hispanics and Native Americans.